Sayuri lives in Italy. After graduating from a postgraduate course in England, in 2001, she met her Italian husband, a music composer, and got married. In the years that followed Sayuri and her husband moved countries every two years, because of her husband’s business. They worked together to create a fusion of classical Japanese dance and modern music and Sayuri started performing overseas. After shifting her dance style to Jiutamai (a kind of classical Japanese dance), she held Jiutamai performances and workshops in each European country, and she also founded Jiutamai School in Paris (France) and Bologna (Italy). Basically, I have longed for foreign movies and life in a foreign country. I lived in Kyoto up until I graduated from university, and I went to a small high school and university for girls, therefore, I wanted to see the world. Had you thought of working abroad during your time studying abroad? I wasn’t conscious of wanting to work abroad but, I always had a feeling of, “I want to continue living abroad”. Would you tell us about “Jiutamai”, that you are spreading abroad now?How did you start? How about local people’s reaction? “Jiutamai” is a kind of classical Japanese dance which is called “Kamigatamai” or “Zashikimai”. In the late Edo period, it developed around Kyoto and Osaka where it was known as “Kamigata”. Compared to 2stage dance” that evolved in the Edo period –which is now known as the classical Japanese dance, Jiutamai is descended from the way of dance in the Heian period and entertainment of the imperial court which is influenced by no play (traditional masked dance-drama). Keeping maturity by eliminating any extra movement, the sophisticated expression was received as a culture between at middle and upper class people, furthermore, evolved as zashiki-gei (performance in tatami room). Danced in a zashiki (a tatami room), the movement is designed to dance within the half-tatami mat without making any dust. It is a unique performance with delicate movements to express the inner mind. Once when I had learned a classical Japanese dance, I happened to see Yuhou Furusawa’s mai. She is grand Master of Furusawa School of Dance. I and my husband were very fascinated by her novelty, beauty and profoundness of dance, and I became her descendant. The words of “Geisha” and “Maiko” are well-known abroad. Jiutamai is geisha dance, and they seem to be interested in learning and performing it. Elegant movements are characteristics of Jiutamai and are very popular. Would you tell us how your interests and concerns have changed since finding what you wanted to do? I had been involved in English-related work such an teaching English to children, also as a guide for guests from foreign countries at Kyoto Gosho (Kyoto Imperial Palace). I studied at a translation school to become a movie translator, and am a qualified interpreter-guide. However,　I’m a kind of “Soon hot, soon cold” and once I acheive at some level, I try to shift my concern to other. On the contrary, a classical Japanese dance which I learned as a hobby has accounted for most of my life without knowing that made me feel destiny to encounter it, not so much my intention as something big power. Jiutami is the most difficult work I have ever experienced. I will continue challenging Jiutamai dance throughout life because of its unfinished pursuance of beauty that has had a huge effect on my life and my thinking. Please tell us your delights, and difficulties in working abroad. Everyone here is delighted to see a person wearing a kimono (This is the charm of the kimonos! ), and I am happy to see them being worn at my performances too. 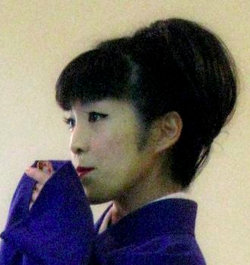 Unexpectedly, there are many women abroad whom are interested in geisha and maiko. I am very joyful to introduce to them Jiutamai, which is considered to be appreciated only in Japan. Ｉ don’t have any difficulties living abroad now. When I teach Jiutamai in France and Italy, I feel impatient and want to use English as it is more familiar to me and sometimes I can’t explain myself in French and Italian fluently. To learn Italian and French more fluently will be my next challenge. As I can’t go back to Japan very often, it is difficult not to dance in my own way without master’s direction when I practice by myself. Do you feel any differences between living in Italy and in Japan? I feel Italians values are completely opposite to Japanese values. The Japanese consider it a virtue to condense words as much as possible and shorten sentences, but the Italian’s way of communication is to lengthen the sentence and even repeat what they are saying in many different ways. Sometimes, they sound as if they are going to start to argue, but it actually brings then closer to each other. When you talk too shortly, they think you aren’t interested in them and they may have a negative image of you. Also, people here don’t require any formality but put high value on content for communications, it is very comfortable for me because I don’t really have typical Japanese formality (laughs). My hobby is watching old Japanese movies and collecting antique kimonos. If you have any relationships with local women, would you tell us how you feel about their life and work styles? There are many types of women, so I can’t say about it unconditionally, but women in Italy are very independent of work and mentality. They don’t rely on their husbands. Having their own work, they enjoy their hobbies as well. Regarding women who have children in Paris, they seem to draw the line with their children and treat them as mini-adults. In Japan, most mothers take maternity leave for one year, but in Paris, most women return to work after just three months. It is also common that they leave the baby with a baby-sitter and go out with their partner. This is not seen in Japan. Italian women have similar opinions. I don’t have any courage or determination but feel something led me here. It might be my destiny. I am not just being passive, I always concentrate on what it is that I want to accomplish with my best effort and repeat that process many times. That’s why I am here now. I am always thankful, I sometimes forget about it when I am very busy though. I also hope to live my life better than yesterday with satisfaction. You have an international marriage with your husband. May I ask how you met him? Yes. When I used to work at Kyoto Gosho (Kyoto Imperial Palace), he came to Japan as a guest from a foreign country. I talked with him a little then. The next day, I received a fax from him. He wrote to me “I would like to talk with you more” and his contact information on it! I started to exchange emails with him as an Italian friend. After a while, I had a feeling, “He might be my soul mate”. After I had met him three times, I decided to marry him. That’s a romantic story! Have you ever thought of marrying a foreigner before your marriage? You gave birth abroad, did you find any good points with the hospital and circumstances? Actually all things were my first experiences, I did not understand it well whilst in labor. It took only three hours for me to give birth. My doctor advised me to bring some favorite CDs and listen to them during labor, but I completely forgot to put on any music in the hospital due to the speedy birth. The most impressive thing is that the doctor who was scheduled to give me a pain relief injection came into the delivery room with a cup of coffee in a very relaxed mood, and he just chatted with others beside me despite I couldn’t even say “Hurry! Give me a pain relief injection!” because of labor suffering and pain. According to the doctor, he thought that the peak of labor pain had not yet come, however, ostium uteri opened at an unexpectedly fast-pace, he was surprised and gave me a shot in a hurry. The pain was relieved for a while afterwards, but I had an intense pain in the second, and he injected me again. Just after that (before taking effect), I had finished the delivery. It may not have been a painless delivery after all…It was serious then, but now it’s just an amusing story. It must be hard to bring up a child abroad. Would you tell us about the situation of child care of the country where you live? I haven’t felt any difficulty regarding taking care of my son. He is three years old now and goes to kindergarten. His teachers don’t support children as much as Japanese ones (this is my experience, and I guess that all teachers aren’t the same) and they treat children plainly. In most families, both parents work outside, so it is the Grandparents job to drop-off and pick-up children from kindergarten. Regarding medical care, the same pediatrician usually cares for children until they grow up, when they are ill they can see the doctor. I think this is a good system that the doctors know each child from when they are little. Do you receive child-care support from your husband, family, and society? My husband hasn’t ever done housework but has been willing to cook, wash dishes, and do laundry from when I was a pregnant. His support is so helpful. When I spend a lot of time with my son I sometimes don’t have time to do all the housework. His parents live near our house, and I have them to help us when possible. We don’t receive any child allowance here in Italy. A thing such as lump-sum allowance for childbirth and nursing is very little compared with Japan’s support. The government support is more detailed in Japan, but the unity in families is firmer in Italy. As advancing of globalization, increasing parents who want to have children learn a foreign language including English in Japan. Would you provide any advice on it if you work on practical method about language and other special educations for your son? Could you give us your comments for the Japanese language education, too? My son is three years old now, I speak to him in Japanese, and my husband uses Italian. Now, he uses either language naturally depending on the situation. However, when I talk to my husband, I mix languages using Italian and Japanese. My son copies my way of speaking so I sometimes think that I should be careful about it. When I talk with my husband in English and my son sometimes hears our conversation, even though he can’t speak English I am surprised how a child can really absorb everything like a sponge because sometimes he seems to understand our conversation. He is better at a Japanese than Italian now but will learn and improve Italian in kindergarten in the future, and it is difficult to keep Japanese. I hear from some mother friends who reside in foreign countries that they gave up Japanese language education for their children. I know an international couple, who resides in the foreign countries, and a mother (she is Japanese) always talked to her child only in Japanese, and her child who is 10 years old now is a wonderful bilingual. Mother’s exceeding efforts and patience are beyond our imagination to keep it constant. It isn’t so easy to maintain bilingual up until a child becomes an adult and studies voluntarily. I haven’t planned that I have him learn something yet, and we now live in tri-lingual, Italian, English, and Japanese circumstance in daily conversation. I open Jiutamai school at home and my husband is a harpsichord player, and he sometimes enjoys playing it with our son (he merely beats the keyboard of it freely though). I am satisfied with him to become familiar with cultural circumstance naturally. What do you value besides languages for bringing up your son? I would like to nurture and cultivate his mind, and it’ll become a treasure for him in the future. I hope my son to have healthy, stable positive mind and humor for having consideration for others like me. It may be a big change that I don’t consider the formality isn’t important now. Do you have some goals and challenging in the future? My son is still young and I am not good at doing multi-work. So currently I focus mainly on raising my son and have a little time for Jiutamai. As he grows up, I would gradually like to make more time for Jiutamai. With advancing age, it is said that a dancer can express profoundness and beauty in Jiutamai. I feel various suffering and joy in daily life that help me grow. It would be wonderful and is my goal, to reflect these feelings in Jiutamai dance. I would like to keep spreading Jiutamai abroad till my child grows up. When I become a grandmother, I have a desire to teach a few familiar students in the small tatami room of a Japanese house. Have as many experiences as you can, and meet many people! Sayuri teaches Japanese culture abroad whilst raising her child. That gives us her active impressions. She was born and raised in Kyoto and therefore has an elegant and gentle personality. Ladies in Kyoto are considered as slow-tempo and elegant (Hannari atmosphere). Thank you for sharing your wonderful story, Sayuri-san!